They say happiness comes in small packages. Well, the little bundles of joy running helter skelter and colouring DRS International School with their imagination and creativity, certainly proved the adage to be true. The 5th Annual Day of DRS International School, aptly named ‘Kaleidoscope – Reflections of Life’, was a showcase of how talented these little students – across grades 1 to grade 12 – really are. The six-hour event brought to life the colours of childhood, with programmes ranging from exhibition of origami & handicrafts to dance, song and drama. 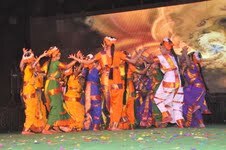 The bedazzling performances and the giving away of the annual awards was graced by the chief guest Smt. Vakiti SunithaLaxma Reddy, state minister for, Women Development, Child Welfare. The luminaries gracing the occasion included , K Laxma Reddy, MLA, Medchal, K. SrisailamGoud, MLA, Qutubullapur, Narsareddy, MLA, Gajwel, M HanumanthRao, MLA, Medak and Dr. C.N. Gopinatha Reddy, Former Addl. DGP, Govt. of AP. “Most people from outside the School would think of Kaleidoscope as a one-off event. However, at DRS International School, this is what we do. We nurture talent. What you see here is the culmination of the hard work that the students and their teachers put in throughout the year,” commented Mr. Dayanand Agarwal, the founder of DRS International School. “As I always tell my staff – the highest reward for a person's toil is not what they get for it, but what they become by it. And today, looking at these kids, we have all found that little child hidden in the deep recesses of our heart. That’s our reward,” quipped Mr. AK Agarwal, who heads the marketing division of DRS Group. “Our vision is to create a society of progressive, thinking individuals who will contribute to the intellectual development of the global Community by initiating positive changes in the social fabric,” said Mr. GulabRamchandani, Principal of DRS International School and the former Principal of Doon School, Dehradun. Apart from the various fields of art, the children performed an unusual and vast array of dances including the Rumba, Regatta, Japanese dance, Australian dance, Hip Hop, Funky Style, Samba, Western Bhangra, Salsa, Kawali and Andhra Folk. About DRS International… DRS International School is a highly progressive and enterprising school pledged to provide quality education with great emphasis on traditional values. At DRS, we are re-inventing education by breaking old mounds of thought. This progressive thinking has led to progressive teaching methods and brought about a tremendous change in how education is imparted.DRS International School is the dream of one man - Mr. DayanandAgarwal, Chairman and Managing Director,DRS Group of Companies.He entrusted the execution of his project to his two sons, Mr. Anjani Kumar and Mr. Sanjay who handled the educational aspects and the infrastructure respectively. After all these years of its inception the school has become a landmark institution in the field of education in Hyderabad. In Mr. GulabRamchandani, former Principal of Doon School Dehradun and a school facility planner of international renown, Mr. Agarwal found the right person to translate his dream school into the reality it is today. Mr. Agarwal entrusted the execution of his project to his two sons, Mr. Anjani Kumar and Mr. Sanjay who handled the educational aspects and the infrastructure respectively. A year after its inception the school has already become a landmark institution in the field of primary education in Hyderabad.